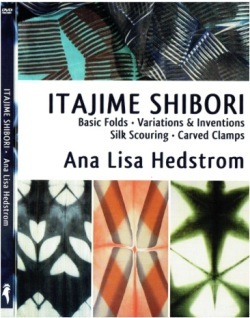 Folding fabric before wrapping or stitching has been a large part of Ana Lisa's shibori dyeing, and it was only natural that she would become fascinated with Itajime clamp resist. This new DVD covers both traditional and contemporary variations of Itajime. DISC ONE features a look at traditional Japanese itajime. Working with kimono width cloth (about 14”), the fabric is folded into square, rectangular, or triangular bundles which are clamped with rectangular, square, or triangle blocks. Even with these constraints the possibilities are endless! Chapter 2 focuses on unusual ways of folding and a variety of shaped blocks, and experimentation is encouraged. DISC TWO gives instruction on resist scouring organzas using clamping to create areas of soft lustrous silk juxtaposed with the crisp areas stiff with sericin. She demonstrates the use of thickened Fibre Reactive dye (Procion) which takes very differently on the scoured/ non scoured areas. One can achieve bright reds and dark grey with one dye paste. Disc two concludes with an introduction to Kyokechi, carve clamp resist. Historical examples are shown along with a contemporary approach using CNC (computer numerically controlled) routing to create carved blocks. This is an area for much exploration!